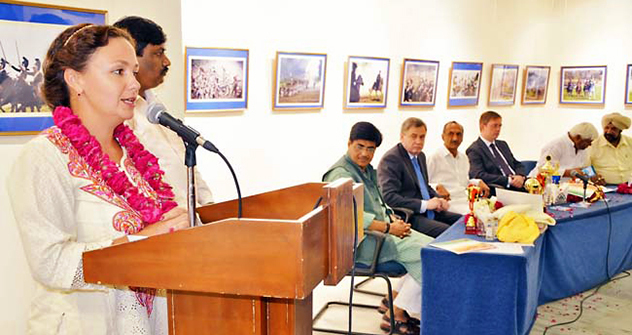 A Russian linguist awarded for her role in the promotion and development of Hindi, shares her vision and passion. The world is drawn to Incredible India for its intriguing cultural diversity from spirituality to holistic health or from mythology to Bollywood. Many realise that the key to truly appreciate and connect with the country is to know one of its most widely spoken languages, Hindi, which is spoken and understood in various dialects in many parts of India. Yet the country is a multilingual and English is a widely preferred medium. The significance of Hindi in such a diverse scenario can be aptly explained by Yulia Aryaeva, who was awarded the “Hindi Ratan” by the India-Russia Friendship Society for her commitment to promotion and development of the language. She cherishes her experience as a teacher of Hindi, “induction meetings with first year students used to be one of the most pleasurable times. Most of the students didn’t know much about India or the Hindi language. I used to tell them how lucky they were to have an opportunity to study this beautiful country and this nice language,” Aryaeva recalls. The Russian diplomat and goes on to explain the role a language plays in fostering cooperation between two nations. “Language serves as a unique tool to understand the soul of another nation and excellent command of a foreign language makes one a real envoy of one’s own country. It is heartening to see an obvious revival of interest for national cultures among the young people of Russia and India. Therefore, they should be given a chance not only to meet but to also get a more profound insight into each other’s culture through international student exchange programmes,” she says. Aryaeva also cites the example of Voice of Russia Broadcasting Company, which claims about 150 radio listener clubs across India for its transmissions in Hindi, Urdu and Bengali and also presents capsule programmes through one of Delhi’s popular Hindi radio stations.